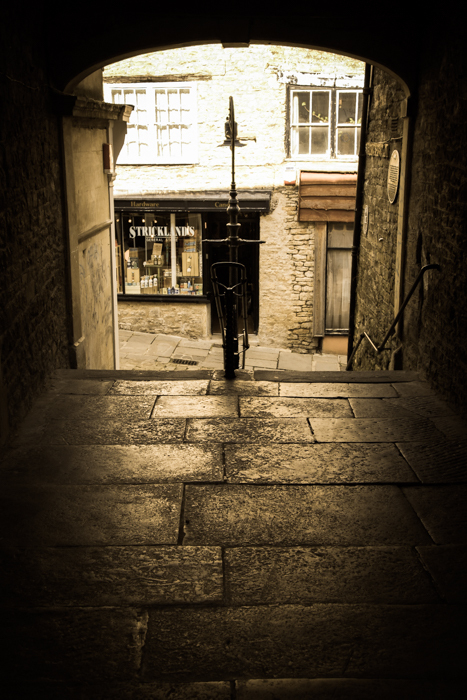 I don’t know how many times I’ve photographed Frome, but then, for a smallish place there’s a lot to look at. Plus, although I’m ensconced in Bruton nowadays, Frome, being a place with which I have various connections and one of the closest towns with a decent range of shops, is also a place where I spend a good deal of time. For a photographer such as myself, with a particular interest in architecture, it is a gem worth exploring over and again in its various parts and in different seasons and light effects. There are the typical views of Catherine Hill, the Heritage Museum and assorted cobbled streets, which it seems everyone has to photograph - including me - but there are also all the less-noticed nooks and crannies, some of them quaint and ancient, others more a part of everyday life as it’s lived now. This clearly falls into the former category. This is the archway where Sheppard’s Barton meets Catherine Hill. It’s just one of those things seems to beg to be photographed. In art terms, it’s more or less a readymade: the beautiful old arch and glinting, worn paving slabs, looking out onto an ancient shop (albeit with trendy, modern signage), make a symmetrical composition that seems just made for the camera. Of course, the layers of architectural structure and varied light levels set up issues of extreme light and dark, which the camera struggles with. This is dealt with by shooting RAW and pulling back the highlights, post-production, into something reasonable, but also to an extent by accepting the imperfections of intense light and dark, as they help create the atmosphere and conjure references to old-style photography, which seem appropriate to the image.